The ex-governor of the northern Mexican state of Chihuahua, César Duarte, is suspected of stealing hundreds of cows bought with public money. Mr Duarte was declared a fugitive after leaving Mexico in March when he was accused of embezzling millions of pesos. He is believed to be hiding in the US. The latest allegations against him surfaced in official documents published by a non-governmental organisation fighting corruption. While Mexicans are used to politicians being involved in multi-million dollar corruption scandals, these latest allegations have caused outrage because they illustrate how the most needy are often the ones to suffer. The cattle were bought with public funds and imported from New Zealand in 2015. The animals were meant to be handed over to small-scale ranchers in Chihuahua to repopulate their herds, which had been decimated by a drought. But the documents suggest that 903 out of the 1,408 animals imported into Chihuahua were taken to a ranch owned by Mr Duarte, with hundreds more being given to close political associates of his. According to the investigation by Mexicans Against Corruption and Impunity, only 150 animals were given to needy ranchers. In October 2016, Mexican newspaper Proceso and La Jornada reported that 345 of the cows from New Zealand had been taken to Mr Duarte's ranch. But the official documents released by Mexicans Against Corruption and Impunity suggest the total number was more than double that. The NGO spoke to two small-scale ranchers who had taken out loans to buy some of the cattle. They said they had paid out the money but the animals never arrived. Mr Duarte, from the governing PRI party, was governor of Chihuahua from October 2010 to October 2016. He was known for his lavish lifestyle and is accused of using an official helicopter to fly friends and family to his ranch at weekends. He is suspected of embezzling 79m pesos ($4.2m; £3.2m) during his six-year term and channelling the money into his party's coffers. 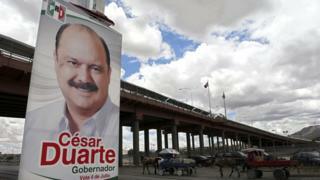 His successor in office, Javier Corral from the rival PAN party, ran on a promise to bring Mr Duarte to justice. Mr Duarte has been spotted in Texas, New Mexico and Florida.